Bowling Ball Garden in Brookline. Hopeful for Spring. This was shot two weeks ago but I wanted to post this bowling ball garden in a Pittsburgh neighborhood- Brookline. Thanks to Donna for finding it for me. Tuesday March 5th is Fat Tuesday, Mardi Gras. Pączki is pronounced Poonch–key. 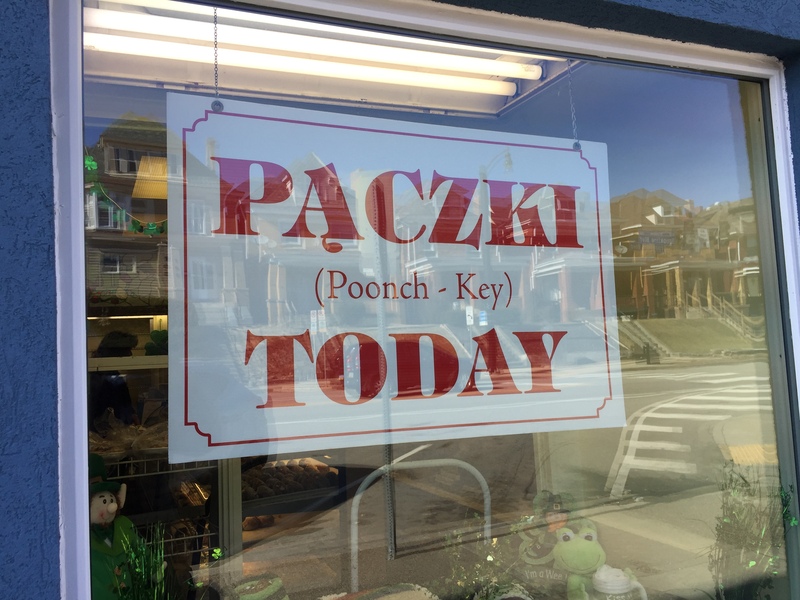 The Pączki sign was in the bakery window as my friend Donna and I were headed to her home after eating breakfast in Dormont. I had never heard of them.We parked and I went into the bakery and Lynn was wonderful to tell me all about the Pączki. I bought six, three for Donna and three for Steve and me. Lynn put each order in white bakery bags. When we got back to Donna’s we cut one in half and shared it along with a cup of tea. If you live in Pittsburgh they are available through Fat Tuesday at the Party Cake Shop on Brookline Boulevard. 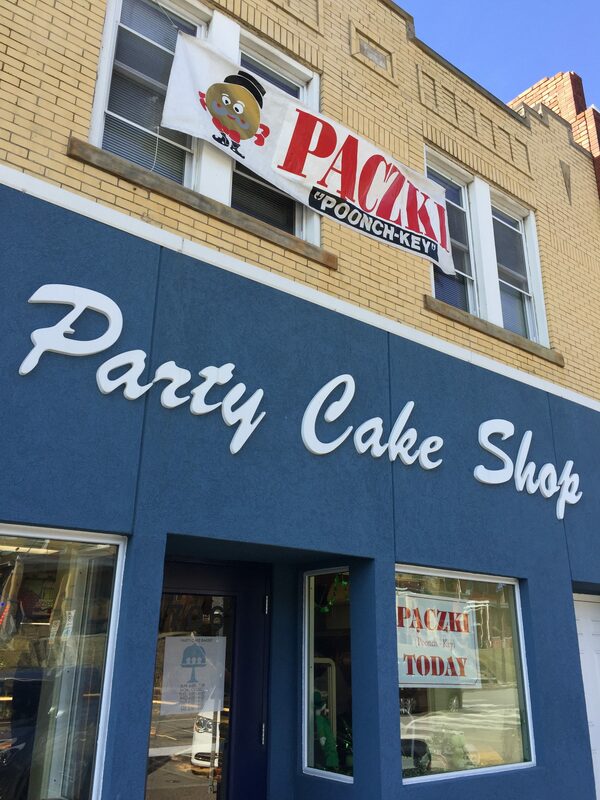 Here is what the Party Cake Shop says “Pączki is a pre-Lenten Mardi Gras tradition deriving from the Polish word meaning little package. The taste reminded me of a fresh doughnut from childhood. Much tastier than any doughnut I have eaten in years. I see there are recipes online to make your own but a trip to Party Cake Shop would be well worth the effort. Last summer visiting friends took the ‘Burgh Bits and Bites Food Tour in Pittsburgh’s neighborhood of Brookline. A couple of dear friends flew from Florida to Pittsburgh to see my art show and attend the closing reception. They’d gone online at home and arranged to go on a walking food tour of the Pittsburgh neighborhood, Brookline. Yesterday, Shuey sent me the photos and captions. They really enjoyed the ‘Burgh Bits and Bites tour. There are tours in other neighborhoods,the Strip District, Bloomfield and Shadyside. In fact, two were already booked up and so they chose Brookline. Shuey made it easy for me by numbering the photos and text. I’m sending individual pics to tell the story of how pita bread is made. First the secret recipe dough is made fresh, formed into a biscuit of dough and comes out here where it makes a left turn and heads into a machine that flattens it out. After it’s flattened into a super thin pancake it makes a few turns and heads into the oven. In the oven for 22 seconds at 1200 degrees. They are so thin entering the oven that I couldn’t even see them until about half way through they just materialize out of thin air in a second . . . like magic! Out of the oven they continue their journey cooling off. The cooled pita breads drop off the conveyer onto a table where they are manually deflated and stacked then handed off to another worker who bags them up for shipment to stores in 14 states. This is Joe Cuchines, owner of Pitaland and two of his employees. He came to America with 1 dollar in his pocket and . . . he’ll tell his story best. Thank you Shuey for such a great guest blog. I’m going to have to take the tour.